Hard Drives to reach 3TB in 2010? Sources close to Seagate roadmaps have leaked the potential of a 3TB SAS drive being released this year. The quest for storage is almost a never ending saga. 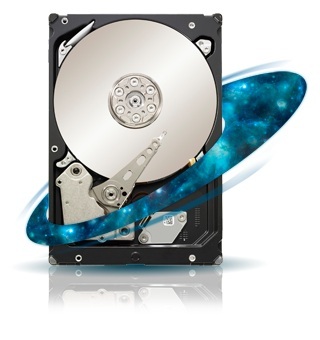 Dubbed the Constellation-ES, the replacement for the Seagate Barracuda-ES, the drive is expected to arrive later this year with a 7200 RPM rotation speed, and a 6Gbit/s SAS interface. A 1TB version of the 2.5" Barracuda-ES is also expected to arrive around the mid year point. A 3TB drive would suggest an increase in maximum platter size, from the current 500GB limit. If you remember back that far, the increase in density was due to a change in bit alignment, from horizontal to vertical, to counter the superparamagnetic effect. Hitachi made an excellent and funny flash animation to describe the technology. The feeling is that the increase in platter size is an extension of that technology, rather than a new physical property being exploited. Depending on how quickly these new hard drives hit the enterprise sector, we could see consumer 3TB hard drives by the end of the year as a positive estimate. However, 17GB/$ ($175 a unit) or a price comparable to current 2TB hard drives would be required for consumer market acceptance. Whether people require 3TB is another matter - video editors, professional photographers, or just for storing your movie and blu-ray collection are possibilities. Disk vendors have been offering 7200 RPM enterprise SAS disks for a while now. Seagate offered the Barracuda ES.2 and now the Constellation ES in both SAS and SATA variants. As you can imagine, there is a slight price premium associated with the SAS versions over their SATA counterparts. The video animation is awesome. 1. Store 2 TB of data across 2 x 1 TB drives. 2. Store 2 TB of data on a 2 TB drive. Yes, that was my point. Storing things on a single drive is less risky than storing it on any number of (un RAIDed) drives greater than 1, assuming that you treat any data loss as undesirable. And besides the point, you are making a backup (... right?) so your concern is not whether you get the data back, but how quickly you can get up and running again. A large drive simplifies this considerably.